After a long time we (Gaurav, Mrunal, Nitin, Praveen, Sandip, Saurabh alongwith me) were gathered to roam around another unvisited place. 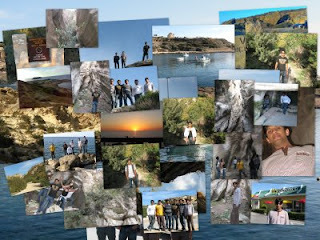 We started gathering the information about the Rocking land - Akamas, but we didn't. I am referring here the rocking land, with the land itself full of rocks, not where some rock star born, or any rock band going to perform. But we were really going to rock there at the rock land. Earlier we were having this plan on Saturday so that can relax on Sunday. But some of our friends were busy in office work (due to recession period in industry) and some in other stuff. So plan seems to be all in vain. Somehow during Sat night I pinged/communicated to all of them to get ready at 10 AM max. But besides me & my flatmates, all were ready on-time You can think of, the level of excitement. We manage to start our rocking journey only 40 mins late :-) with some quick calls/complains. It was really awesome place. One rock was like a bridge between rock walls above us. It's time to capture another array of snaps. No-one wants to miss any moment there and everyone was trying not to hold the cam. We found there reef limestone, grain-stone and many more. (couldn't remember other names) At the end, we finished our journey with the pleasant sunset. For more of my pics of other trips and excursion: Click it. I am glad that i made this mistake of not attending Akamas with u.I am so proud of this mistake that I intend to repeat it again and again.Earlier I was a little doubtful that the place sucked but after seeing the pics u have proved that I was 100% correct. @Sumit: I know, you don't want to spend bucks. carry on.. anyways thanks for the comment. Nice short description of Akamas ....will surely like to visit now .... @Sachin : Good u started a website where we all friends can share their eventful experiences with the rest .